In search of the past and the present we follow the map given to us by our accommodation host to the Stone Circle in Ballynoe, not far from Downpatrick in Co. Down, Eire. Walking the long footpath, under the overhanging branches, past the daffodils, primroses and nettles, we pass a stile, move through a gate and find ourselves in an open field facing a most beautiful large stone circle. About 50 stones remain at this ancient Stone Circle, which has stood since time immemorial. I enter the circle and stop in reverence at the Mother Stone. She stands in the South. I continue to walk sunwise around the circle, using my mala to dowse the way. I am called to stop before a larger stone, standing in the west. Blessings flow to all. I breathe deeply and continue to walk sunwise around this Peace Circle. My feet stop at a group of three stones. My feet draw me on around the circle. I stop in the East at a Portal and see before my inner eye a pathway upon which a procession of royalty approaches – this is a place of entrance for Royalty. Slowly I continue on to the South East and stop as another Stone calls to me. Slowly I walk on and return again to the Mother. I step outside to a Stone, standing behind the Mother Stone. I then proceed to walk the inner circle and come across a Place of Annihilation and a Place of Remorse – my feet hurry on. 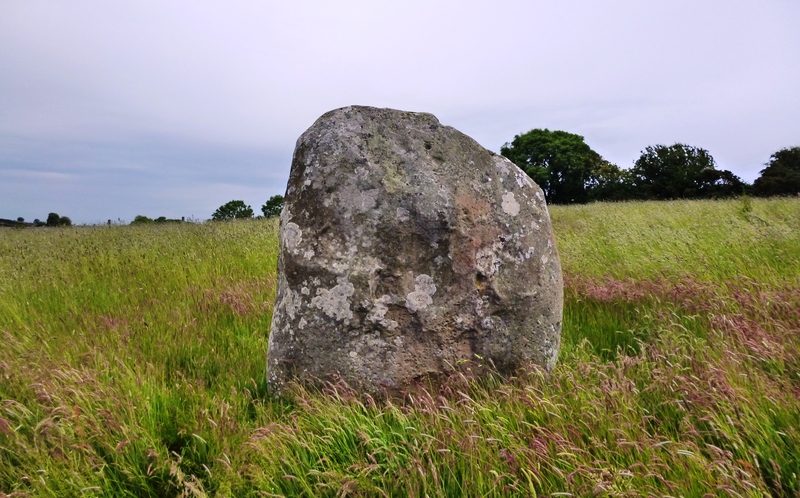 I continue walking and complete the second sunwise circle, stopping at the Mother Stone. As I commence the third sunwise circle stepping close upon the inner mound I am directed not to approach too closely – a Ring Pass Not exists. A vision of an old structure from ancient days appears before my inner eye. This structure is fort like and seems to be a place for the Law. In its current place excavations in the 1930’s, bones and relics where unearthed which where subsequently dated back to the Neolithic – Old Stone Age, 2,000 BC. In silence, I join Arjuna and we stand and meditate sending out peace to Ulster from this beautiful Remembrance Stone. After resting with this peace for some time within the Circle, we quietly leave and wander back up the fairy path to the outer world. More beautiful photos of the stone circle can be found at Soul Centered Astrology & Spiritual Healing Facebook page. In Old Gaelic Lugnasad. (Luġnasaḋ, Lughnasadh and Lughnasa), which also means the name for the month of August, was the annual celebration of the Harvest Moon celebrated on 1st August. In Irish mythology the Lughnasadh festival is said to have been begun by the god Lugh as a funeral feast and sporting competition in commemoration of his foster-mother, Tailtiu, who died of exhaustion after clearing the plains of Ireland for agriculture. The first location of the Áenach Tailteann gathering was at Tailtin, (between Navan and Kells about 2 hours south west of Ballynoe). Historically, the Áenach Tailteann was a time for contests of strength and skill and a favoured time for contracting marriages and winter lodgings. A peace was declared at the festival, and religious celebrations were held. This Festival was also held in honour of Carmun, a goddess of the Celts. As part of the Festival a solemn cutting of the first of the corn of which an offering would be made to the Deity by bringing it up to a high place and burying it; a meal of the new food and of bilberries of which everyone must partake; a sacrifice of a sacred bull, a feast of its flesh, with some ceremony involving its hide, and its replacement by a young bull; a ritual dance-play perhaps telling of a struggle for a goddess and a ritual fight; an installation of a head on top of the hill and a triumphing over it by an actor impersonating Lugh; another play representing the confinement by Lugh of the monster blight or famine; a three-day celebration presided over by the brilliant young god or his human representative. Finally, a ceremony indicating that the interregnum was over, and the chief god in his right place again. Lughnasadh celebrations were commonly held on hilltops. Traditionally, people would climb hills on Lughnasadh to gather bilberries, which were eaten on the spot or saved to make pies and wine. It is thought that Reek Sunday—the yearly pilgrimage to the top of Croagh Patrick in County Mayo in late July—was originally a Lughnasadh ritual. As with the other Gaelic seasonal festivals (Imbolc, Beltane and Samhain), the celebrations involved a great feast. In the Scottish Highlands, people made a special cake called the lunastain, which was also called luinean when given to a man and luineag when given to a woman. This may have originated as an offering to the gods. Another custom that Lughnasadh shared with the other Gaelic festivals was the lighting of bonfires and visiting of holy wells. The ashes from Lughnasadh bonfires would be used to bless fields, cattle and people. Visitors to holy wells would pray for health while walking sunwise around the well. They would then leave offerings; typically coins or clooties (see clootie well). In Gaelic Ireland, Lughnasadh was also a favoured time for handfastings – trial marriages that would generally last a year and a day, with the option of ending the contract before the new year, or formalizing it as a lasting marriage. In Ireland, some people continue to celebrate the holiday with bonfires and dancing. The Catholic Church in Ireland has established the ritual of blessing fields on this day. In the Irish diaspora, survivals of the Lúnasa festivities are often seen by some families still choosing August as the traditional time for family reunions and parties, though due to modern work schedules these events have sometimes been moved to adjacent secular holidays, such as the Fourth of July in the United States. In Ireland, the festival survived as the Taillten Fair, and was revived for a period in the 20th century as the Telltown Games.